The PDO exists to utilize the phenomenon of Phase Modulation (PM). This allows for the relative phase difference of its outputs to be set or modulated, producing very interesting sounds. The result is similar to Frequency Modulation (FM) but affects the output to a greater degree without affecting the stability of the initial frequency. This is where the "displacement" comes in. 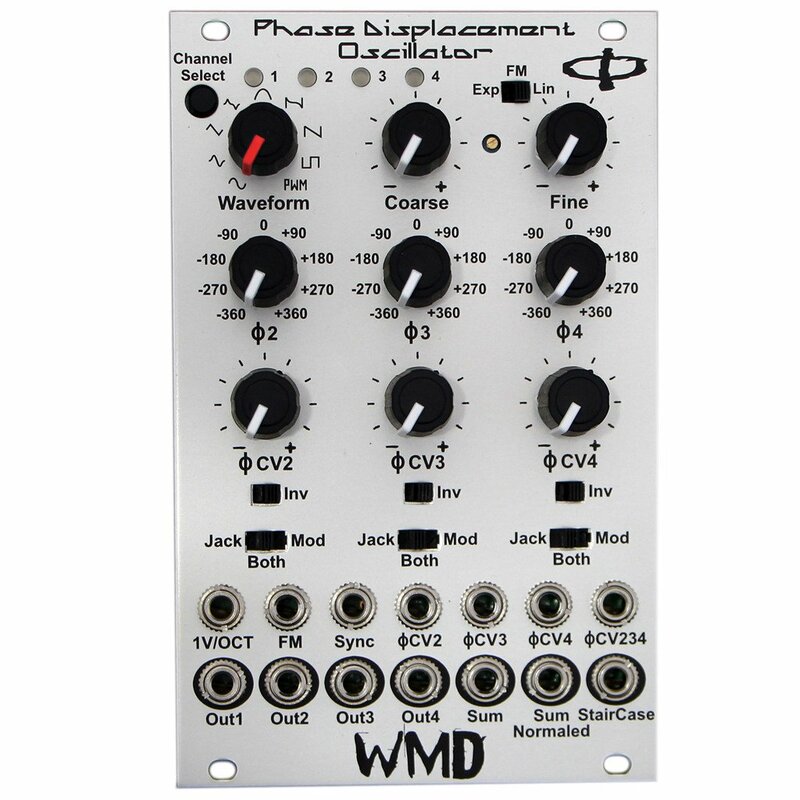 The Phase Displacement Oscillator's analog VCO core should feel familiar and intuitive. Coarse & Fine Knobs - Coarse knob adjusts the frequency of the VCO throughout its full range. Use the Fine knob to tune the oscillator within a 1/3 octave range. Phase Inputs (ΦCV) - The PDO has three phase inputs, one for each channel: 2, 3 and 4. These inputs can use any type of signal. Each phase input has an attenuator. Phase Offset (Φ) - These controls set the relative phase of each channel, from 0 degrees to + or - 360 degrees (total of 720 degrees). This control is added to the ΦCV input and acts as a bias level control when there is an input. Global Phase Input (ΦCV234) - This jack sends its signal to each phase input equally, allowing for a single signal to globally control the phase offset of each channel. Sum Output - This output takes all four of the outputs and sums them together. Sum Normaled Output - This output takes each output (1-4) that do not have cables inserted and sums them together. Use this if you want to remove an output from the sum. The depth from the back of the panel is roughly 26mm. The PDO is warranted for 12 months after purchase. But please contact us if you ever have problems. We will take care of you.